Latham, NY (January 27, 2015) –Deep Blue Communications announced today they have been awarded the Wyndham Worldwide 2014 Supplier of the Year Award. In 2014, Deep Blue installed WiFi networks at 100+ Wyndham franchised hotels that included over 10,000 hotel rooms. Deep Blue Communications now provides help desk support and monitoring services for over 740 Wyndham sites worldwide – including 550 hotel properties. 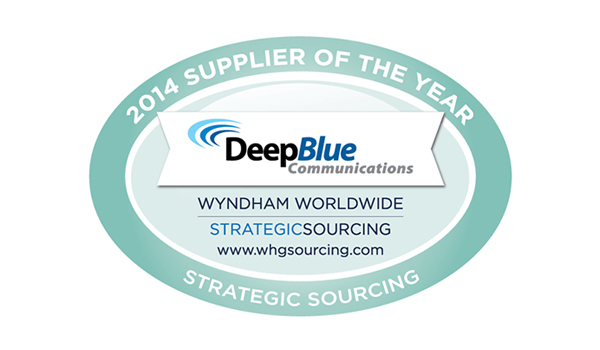 The award recognizes Deep Blue for its overall sales, innovation and support of Wyndham Properties worldwide. Highlights include developing a unique Wyndham Per Room Deal” that helps to simplify the purchasing process for Wyndham hotel owners, creating an online survey tool that allows guests to provide real-time satisfactions scores and lastly, for integrating social media authentication across a select group of hotels to gain detailed analytics and demographics for the hotel owners. One of the world’s largest hospitality companies, Wyndham Worldwide (NYSE: WYN) provides a wide range of hospitality services and products through its global portfolio of world-renowned brands. The world’s largest hotel company based on the number of properties, Wyndham Hotel Group is home to many of the world’s best-known hotel brands, with approximately 7,500 franchised hotels and 650,200 hotel rooms worldwide. This award recognizes our commitment to engineering exceptional networks and applications to meet this growing demand for world-class brands like Wyndham.” said Ryan Donnelly, Deep Blue’s COO. One of the world’s largest hospitality companies, Wyndham Worldwide (NYSE: WYN) provides a wide range of hospitality services and products through its global portfolio of world-renowned brands. The world’s largest hotel company based on the number of properties, Wyndham Hotel Group is home to many of the world’s best-known hotel brands, with approximately 7,500 franchised hotels and 650,200 hotel rooms worldwide. Wyndham Exchange & Rentals is the worldwide leader in vacation exchange and the world’s largest professionally managed vacation rentals business, providing more than 5 million leisure-bound families annually with access to over 107,000 vacation properties in over 100 countries through its prominent exchange and vacation rental brands. The industry and timeshare ownership market leader, Wyndham Vacation Ownership develops, markets, and sells vacation ownership interests and provides consumer financing to owners through its network of over 200 vacation ownership resorts serving approximately 907,000 owners throughout the United States, Canada, Mexico, the Caribbean, and the South Pacific. Based in Parsippany, NJ, Wyndham Worldwide employs approximately 32,800 associates globally.